Animation is all about the timing. The timing comprises many things in animation. It is the duration of an action. It is the speed and velocity of an action. It is the way actions overlap and secondary objects follow the main action. If the timing is off, too slow, too long, too fast, or too linear, the animation will not look realistic. It will be stiff, even boring. The nature of the character, personality or weight of an object will influence the timing of the animation. 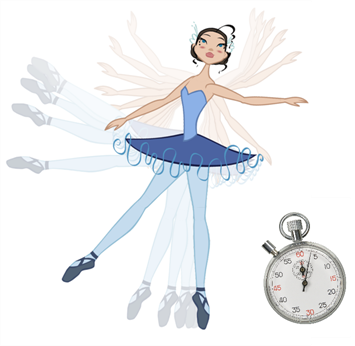 Timing is essential to the development of animation. Story development, gags, reactions and character development all depend on a clear sense of timing in order to be effective. Analyzing and establishing timing are a big part of the animation process. When you're developing the action of a character within a scene, you must determine how the character will move. For example, the difference in the way a character walks will be reflected by whether or not they are feeling dopey, hurried, energetic or lethargic. The timing will be used to influence the speed and rhythm of the movement. The physics of motion determines how objects move in the physical world. It's hard to convince viewers to believe in your story and characters if your animation does not follow these basic laws of motion. Of course, exaggeration is essential in the animated world, but even exaggerated animated action must still follow the basic laws of physics. In North America (NTSC format), the frame rate of animated film is 24 frames/second (fps). For animation mixed with live action, the fps is 30. In Europe it is 25 fps (PAL format). That means that at 24 fps, it takes 1,440 frames to create one minute of action. @ 1994-2019 Toon Boom Animation Inc. All rights reserved.